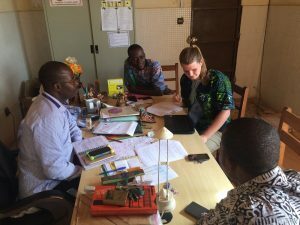 In the Biological and Ecological Engineering Department, graduate students have the opportunity to participate in the Trans-African Hydro-Meteorological Observatory (TAHMO) with Professor John Selker. The project was started in the 90’s when Dr. Selker was in Ghana but the data just didn’t exist. TAHMO’s goal is to install weather stations to countries across Africa, providing weather data needed for research, weather predictions, crop monitoring, and extreme hazard warnings. This automatic weather station is powered by a small solar panel and measures wind speed, temperature, rain, pressure, GPS location, solar radiation, and lightning detection. Students advised under Dr. Selker work in station placement, quality control, and educational outreach with TAHMO. 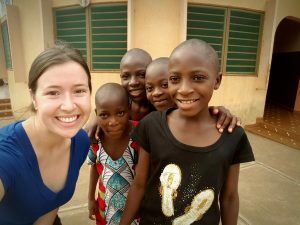 In the winter of 2017, two students had the opportunity to travel to Benin to put their work into practice. The first student, Liz is a second year Water Resources Engineering Masters student. Liz is also the coordinator the School 2 School (S2S) project in TAHMO. The second student, Amelia, is a first year Masters student in Water Resources Engineering. Her research focuses on helping the TAHMO project develop a framework for choosing the best sites to install the weather stations. Most stations are hosted by schools across the region which allows schools access to the data collected. The intention is for teachers to use the real-time weather data from their station as applied science in their classroom. Trainings are designed for science teachers come to learn about TAHMO and gain the skills and material to integrate the weather data into the curriculum. The first training was in the winter of 2016 in Kenya and was very successful. 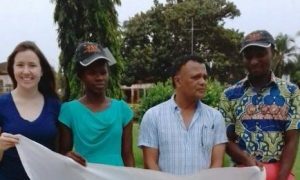 The second training was held in Benin at the SOS Village Orphanage in coordination with GLOBE program. 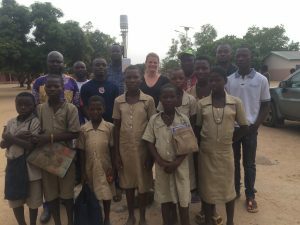 Below is a picture of Liz hanging out with young students at the SOS Village Orphanage in Benin. The first part of the training consisted of introductions of TAHMO and the S2S program. There were so many great questions about the weather station, including battery life, data transmission, data quality control and standards, calibration requirements, etc. It was a pleasure for Liz to be working with such involved and passionate teachers. 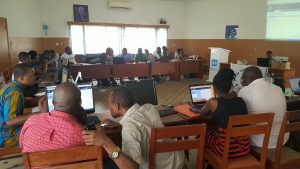 26 Teachers from all over Benin attended the 3-day training. 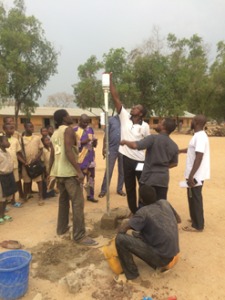 The second portion of the training included three group exercises focusing on using weather data in their classroom. The first exercise was drawing the weather station and labeling the sensors and describing corresponding measurements. The next activity explored the scientific process by explaining the relationship between two meteorological variables. The third activity was to build a cup style wind anemometers to measure the wind speed outside. This is one of Liz’s favorite activities because it involves building a weather instrument, taking measurements, calculations, comparison to the TAHMO station measurement, and a great discussion about sources of error. The winning team whose cup style anemometer was most accurate when compared to the weather station reading won OSU caps. Training evaluations done at the end of the course were extremely useful. First, they identified the part that teachers most valued were the lesson plans. Also, they noted that teachers wanted to go back to their schools and engage other teachers who were not able to attend this training. In response, Liz put together a teacher training “packet” for when stations are installed into schools. The welcome packet includes instructions for accessing the data on the S2S website, a list of required maintenance, examples for in-classroom exercises using the data, and a FAQ sheet. Liz hopes that this material will help teachers be successful at incorporating TAHMO data into their lesson plans. Ultimately she wants the students to benefit from doing science that is applicable and local. The following month after Liz’s return, Amelia traveled to West Africa to visit Benin, Togo, and Ghana. TAHMO is currently working in all three countries, but each is in a different stage of the station installation process. 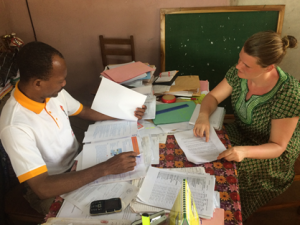 Amelia was able to follow up on some of the work initiated by Liz with the schools. 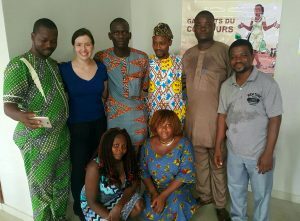 Amelia traveled to 16 schools in Benin and met with teachers and administrators. At each school she gave them more information about TAHMO and to distribute the welcome pack created by Liz. She showed these schools how they can view and download the data online and how to access lesson plans. Amelia’s research focuses on helping the TAHMO project develop a framework for choosing the best sites to install the weather stations. Sites are chosen so they represent the true weather, while taking into consideration social and political considerations. For example, agricultural areas may have a greater need for good precipitation data to plan their crops, and fishing areas may need advanced warning when storms are coming in so that fisherman can return to land and safety. Amelia seeks to find a balance between the sometimes competing objectives of collecting the best weather data overall and collecting it where it is most needed. The main objective of Amelia’s visit was to develop a better understanding of the ground conditions where station installations are occurring so that she can incorporate local needs and constraints into the site selection process. Amelia worked closely with the meteorological agencies in these countries to understand their goals for the weather station network and reach a consensus of the selected station sites. She also documented the concerns of the school teachers and administrators about hosting these stations. Amelia and her team toured school campuses to discuss potential locations where we could install the weather stations and documented the common problems we had when searching for a suitable site. Her team was also able to complete 7 weather station installations during the visit, below are pictures from the station installation at CEG Glazoué. Amelia is writing a document detailing the information she learned during her visit about the social and political considerations relevant to weather station installation. She plans to compare a weather station network designed using traditional optimization methods to a network that incorporates social factors and evaluate the advantages and disadvantages of each. A crowd-funding app has been created where every meter counts to improve weather data accuracy in Africa. Without these weather stations, there is no accurate weather information available in most places. Just download the free app on your phone, it even run in parallel with your other fitness trackers. A donation of $3 for every 5 km you run/walk and $5 is for every 30 km you bike will be donated to TAHMO! Download the app here for Itunes and here for Andriod and bring accurate weather in Africa closer with each step. For more information about TAHMO click here or watch our video here.